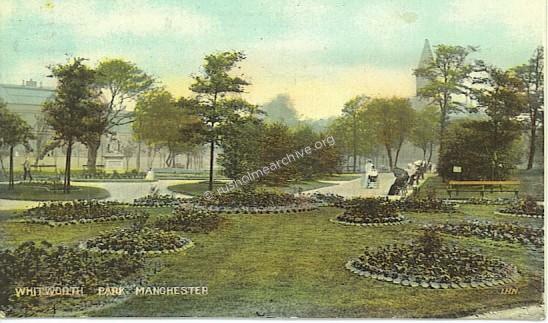 Rusholme is fortunate in having 3 parks for its residents. 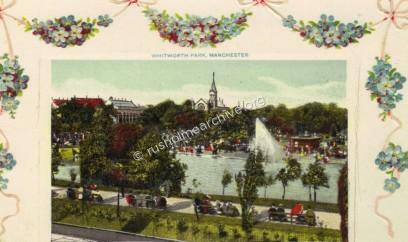 Although Whitworth Park is on the northern border of Rusholme it has in the past been considered part of Rusholme. 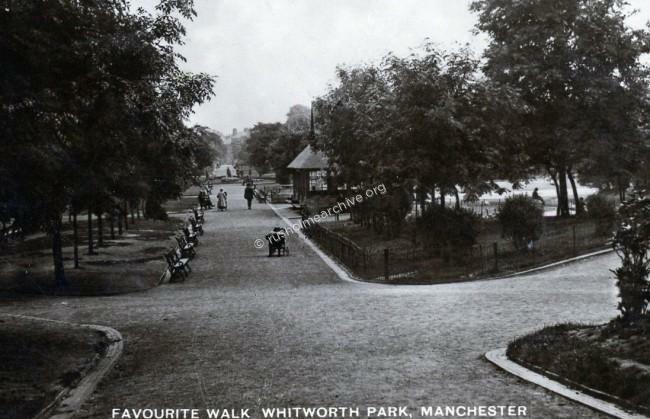 Whitworth Park & Gallery is on the western side of Oxford Road between Denmark Road and Moss Lane East. 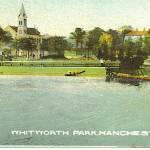 There is a comprehensive history of Whitworth Park and Gallery further down the page. Children always love to play by the lake-side! 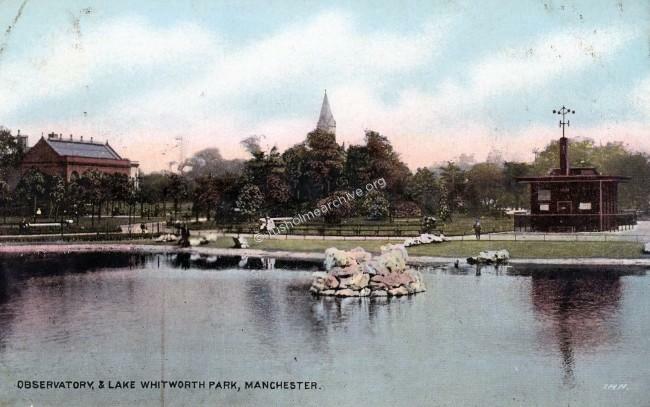 In 1819 on the outskirts of Manchester, the very wealthy Manchester banking family of Entwisle built a large mansion, Rusholme House, set in some 20 acres of land. 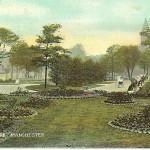 They lived there until 1865 when another wealthy family, the Crompton-Potter family acquired Rusholme House. 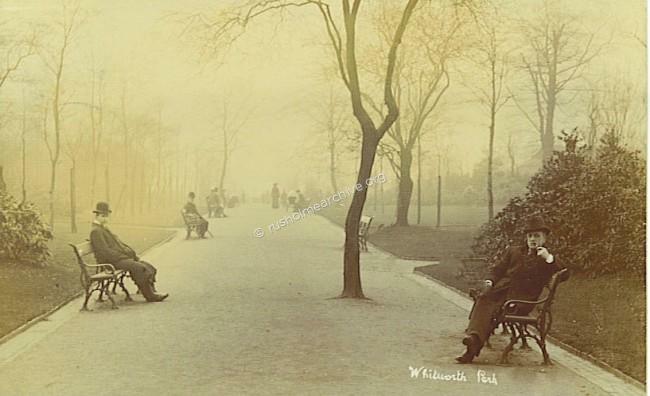 During their ownership, some of the grounds, were opened to the public and became known as Potters Fields. To the northern end of this site, near to Denmark Road, another mansion was built, Grove House. The date when this property was built is unclear, certainly before 1848. Edmund Crompton-Potter died in 1883, his obituary in the local press referred to him as being a notable connoisseur in Manchester and that his collection of pictures were amongst the best. Certainly the collection of art must have been quite large, a few months after his death it was sold at Christies in London for over £32,000. Works by Millais, Landseer, Rossetti, Cox, Romney had hung in the Rusholme mansion - a coincidence that within another year or two there would be a new collection of art being collected and hung in the adjoining property, Grove House, by the trustees of Sir Joseph Whitworth. 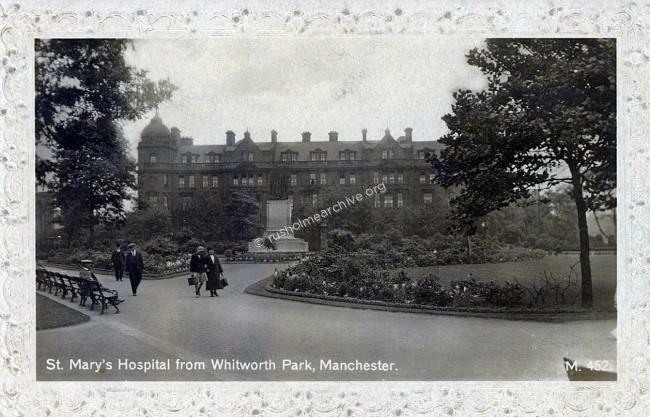 Sir Joseph Whitworth, had been a very successful engineering magnate who for many years lived at The Firs, a home he had built in Fallowfield. As he grew older his health declined and he often spent his winters abroad, dying in Monte Carlo in January 1987 at the age of 84. He was a wealthy man and he left the very substantial sum of £1,227000 for his trustees to be used for educational purposes. 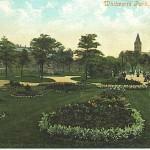 The trustees included an old friend of Sir Joseph, Robert Darbishire, a solicitor who lived in Victoria Park. 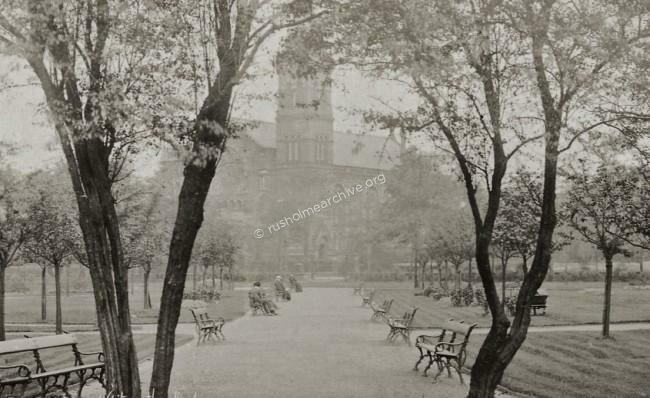 After the death of Edmund Crompton-Potter in 1883 Robert Darbishire had tried to persuade both the Rusholme Board of Health and Manchester Corporation to buy Potters Fields to be used as a public park. 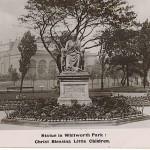 He was not successful but as the trustee of Sir Joseph Whitworth he seized the opportunity and in 1888 he purchased Potters Fields together with the two mansions and started to create the Whitworth Institute & Park. 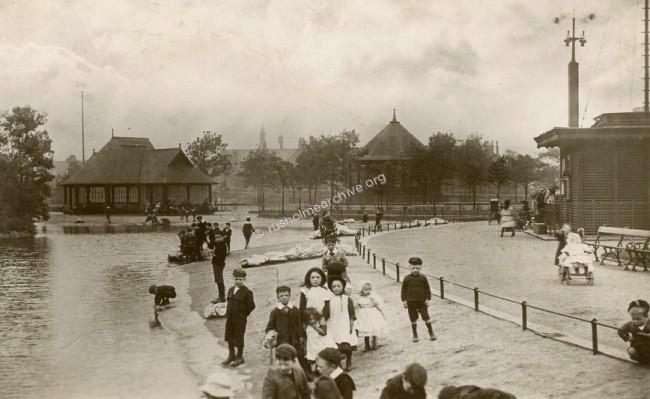 Rusholme House was then demolished, work commenced in laying out the Park and works of art were collected to be hung in Grove House. At the rear of Grove House a large gallery was built and the old mansion incorporated into this structure to serve as part of the Whitworth Institute. Grove House had been the family home of the Hopkinson family who made a substantial contribution to public life in Manchester. Alderman Hopkinson of Manchester, was born in 1824 in Manchester and began life as an apprentice at a manufacturing engineers where he eventually became a partner. He was also interested in several coal and iron enterprises and was for many years Chairman of the Carnforth Iron Works. He had an honoured name in Manchester ; his membership of the Council dated from 1861 and he was Mayor in 1882. 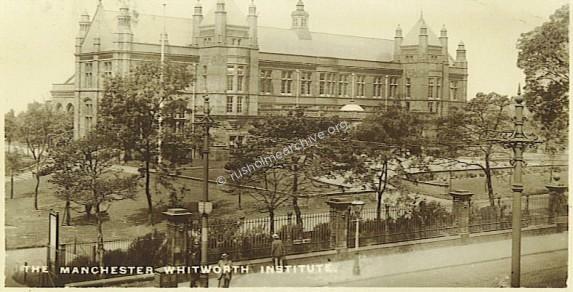 Amongst many other public offices he also served as a Governor of the Whitworth Institute. He married Alice Dewhurst of Skipton whose father was the founder of the successful cotton-spinning factory which bears their name. There were thirteen children of whom ten reached maturity, (five sons and five daughters) and the family lived at Grove house attended to by six servants. All of his five sons were successful, two becoming Members of Parliament and the second eldest, Alfred, was Vice-Chancellor of the Victoria University from 1901 to 15 July 1903 and then of the Victoria University of Manchester until 1913. Sadly his eldest son John, (like his father, a very successful engineer and Professor of electrical engineering at King's College, London), died in 1898, with three of his children while climbing in Switzerland; they were without a guide and the cause of the accident was not known. Mrs Hopkinson and her surviving children gave £5000 towards an extension of a Cambridge engineering laboratory as a memorial to her husband. At Owens College in Manchester his father and other relatives had an electro-technical laboratory built in memory of John. 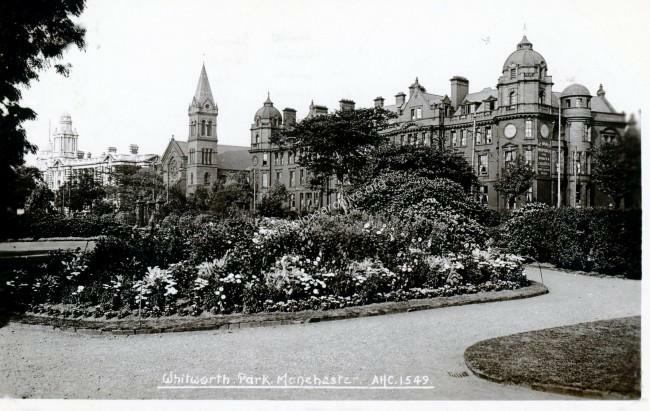 The park was opened in 1894 and Grove House, now known as the Whitworth Institute was opened in 1896. The 3 photographs below are of Grove House in use as the Gallery. I very much appreciate being given permission to display the above photograph and the two interior views below by the Whitworth Gallery. In July 1890 a very critical review had appeared in the Manchester Guardian about the new collection of paintings that were being displayed in Grove House. The review was complimentary about the ingenious way that Grove House had been adapted but said that provincial art galleries were the most unsatisfactory of earthly institutions. They were too often governed by committees of businessmen whose knowledge of art was nil. 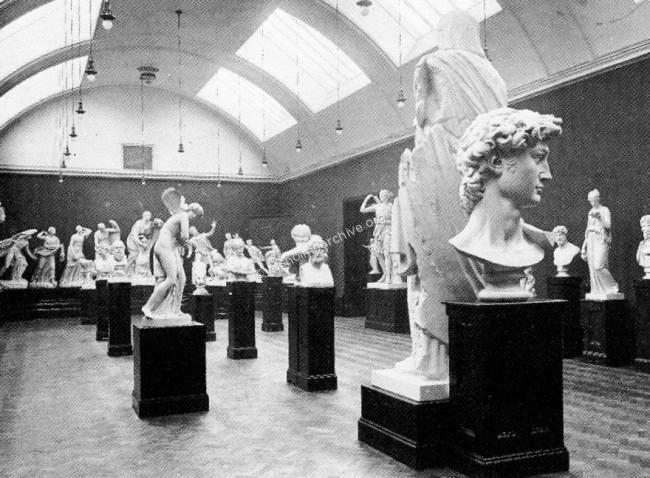 The existing provincial galleries were choked with rubbish, from Manchester & Liverpool down. A critical eye was cast over the Manchester City art gallery for its collection of 'middling contemporary' pictures. What is not wanted in Manchester are two collections of 'middling contemporary pictures! Clearly the collection did increase considerably over the next decade and it became clear that more gallery space was needed. 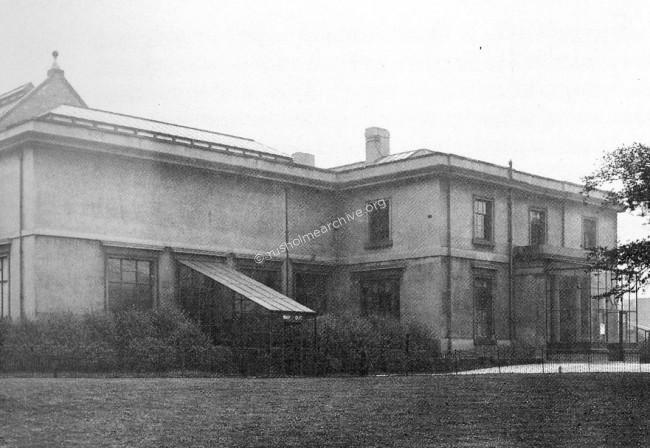 The decision was taken to demolish Grove House, and the building that you see in the postcard below was completed by 1908. The architect was J W Beaumont whose design was selected from a competition supervised by Alfred Waterhouse. 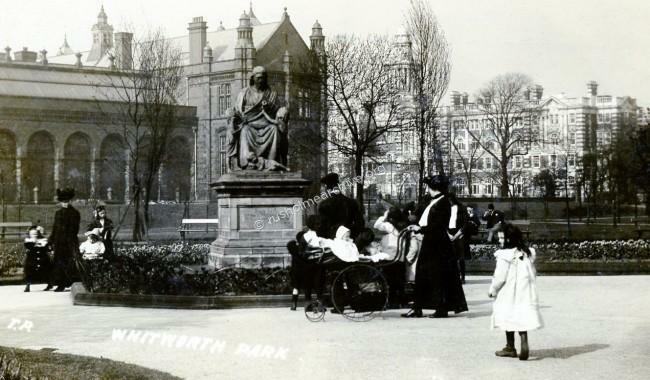 One critical review of the building said that it was hard, mechanical and uncomromising - a fitting monument to the engineer Sir Joseph Whitworth. 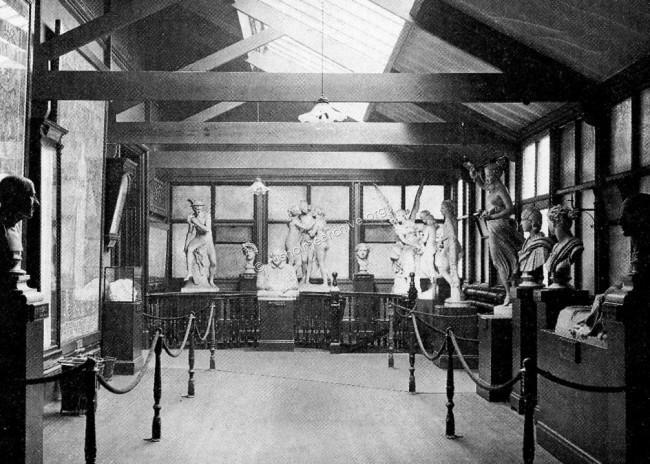 The view of the Gallery above is circa 1910, the trees in the background are still very young. The ticket above is in the Manchester Libraries Archives and I appreciate being given permission to copy and display this ticket on the website. 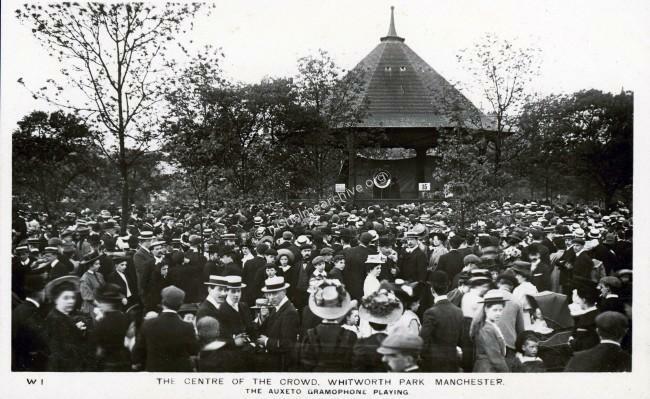 On July 29th 1908 a large assembly of Civic and other dignitaries assembled at noon in the Whitworth Institute, in Whitworth Park, Manchester, to celebrate the completion of the new picture and sculpture galleries and lecture hall and witness their formal opening. 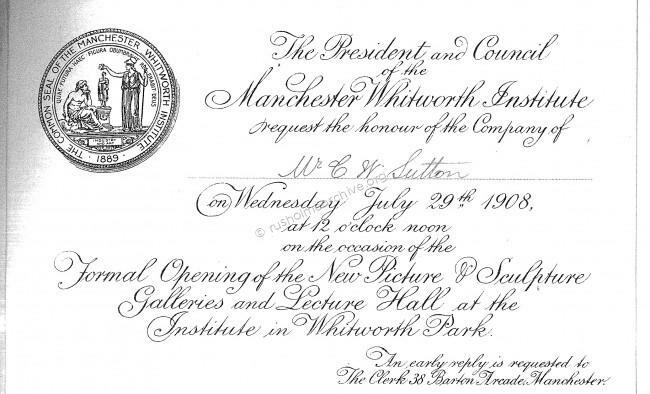 At this formal opening two portraits in oil, one of the late Sir Joseph Whitworth, whose munificent bequest made the Whitworth Park, Institute, and Art Galleries possible, and one of Mr. R. D. Darbishire, the last of Sir Joseph Whitworth's legatees, were presented to the Council of the Institute. 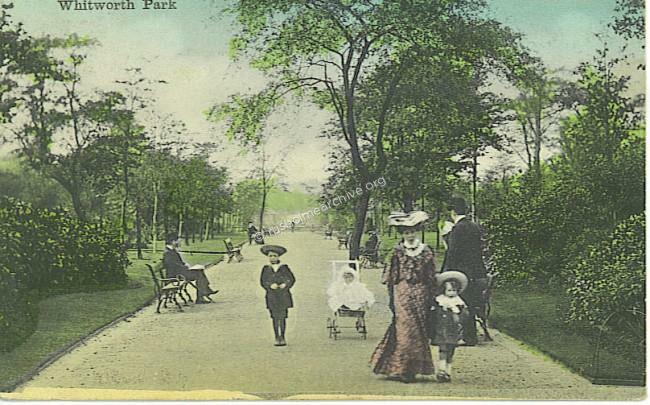 It is generally considered that whilst Sir Joseph provided the legacy, it was the vision of Robert Darbishire in creating the Gallery and Park. The meeting was in the new lecture hall, a spacious room which was to be of great use to the public. As the president of the Institute, (Sir William Agnew) was not able to be at the meeting, the chair was occupied by Sir Edward Donner. "Absolutely for their own use and application according to their respective pleasure and judgment, they each being aware of the general objects for which I should myself have applied such property if I had been able to make such application myself or by my will could bind them." Sir Joseph had wanted a scheme that would interest workmen and above all would be absolutely free. 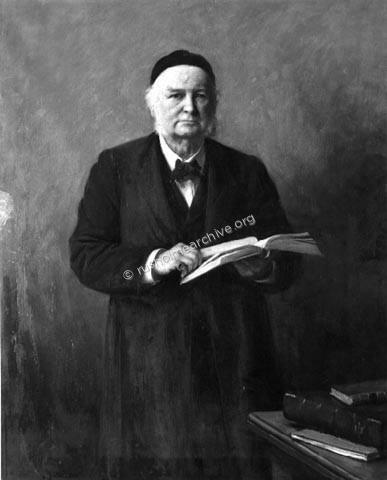 "A worthy memorial of our late friend and neighbour, to secure at once a source of perpetual gratification to the people of Manchester and at the same time a permanent influence in the direction of technical education and of the cultivation of taste and knowledge of the fine arts of painting, sculpture and architecture". 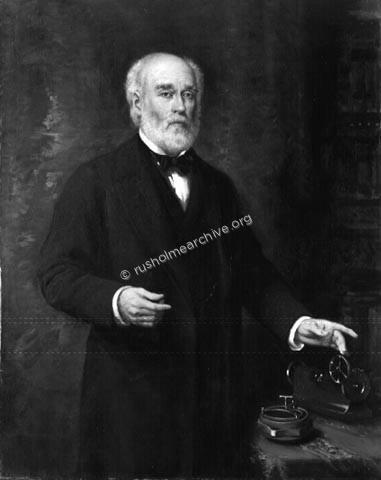 There were further speeches, notably from Sir Charles Holroyd, Director of the National Gallery and then finally the proceedings referred to the two portraits of Sir Joseph Whitworth & Robert Darbishire that were presented to the Gallery amidst much cheering.
" 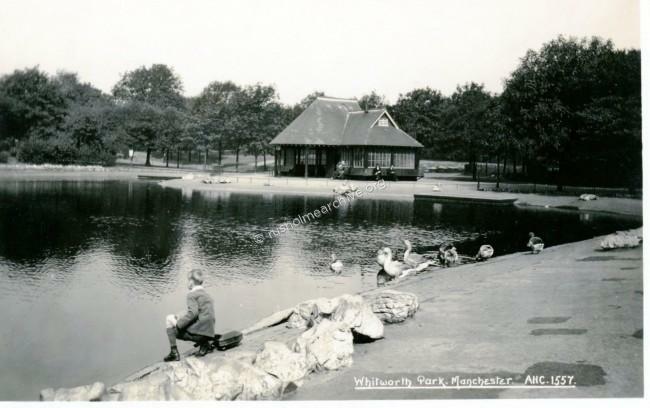 They will prove, I hope, an incentive to those who see them to emulate Sir Joseph Whitworth and Mr Darbishire in doing all they can for the welfare of this great city." 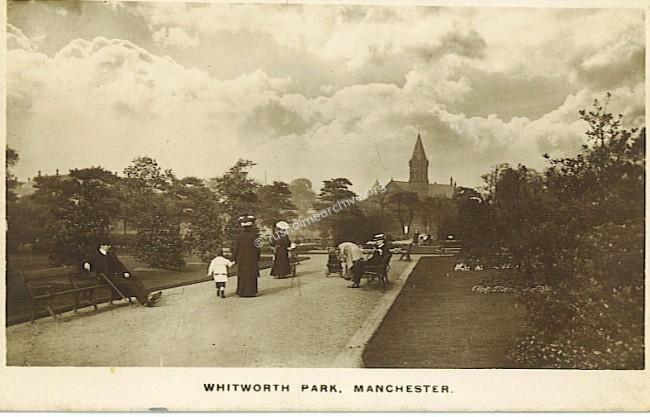 The following notes relating to the Park history were provided by Heather Birchall, formerly a member of the curatorial staff at the Whitworth Art Gallery and I very much appreciate her help. In between some of her text I have added some more postcard views. 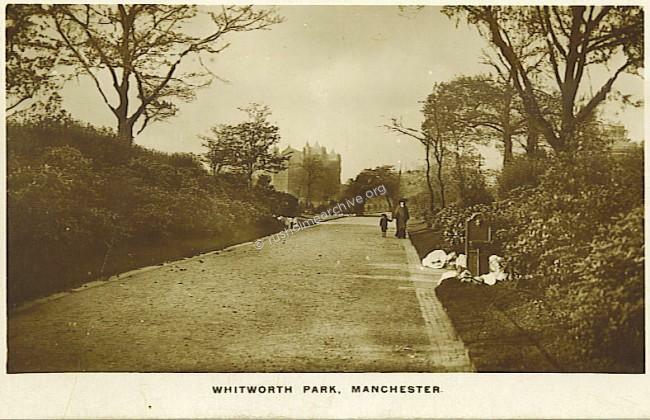 One of the greatest assets of the Whitworth Institute was its twenty acres of surrounding parkland which, according to the Manchester Guardian, had the potential to add greatly to the ‘amenity of life in our unlovely city’. 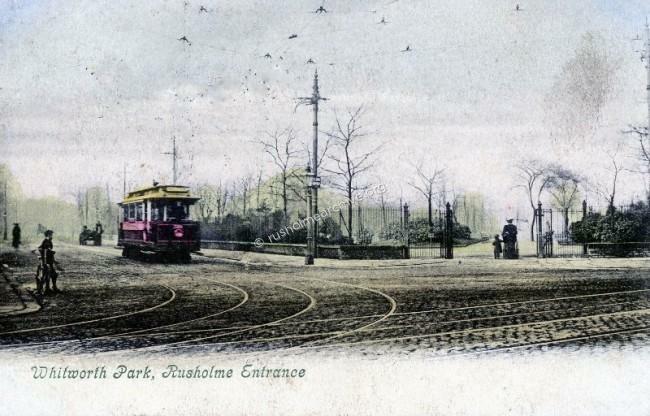 Although part of the park had been public since 1884, it was enclosed by brick-walls, and newspaper reports highlighted that only glimpses of green space could be seen from the top of passing tramway cars. 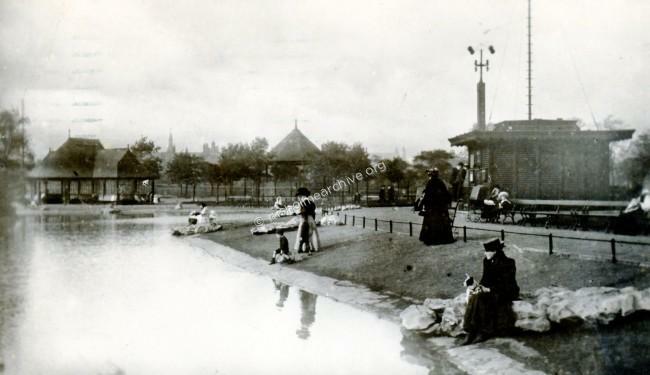 In addition, although this area was leafy, there were few areas of recreational land to serve the growing populations of Moss Side, Hulme and Longsight. 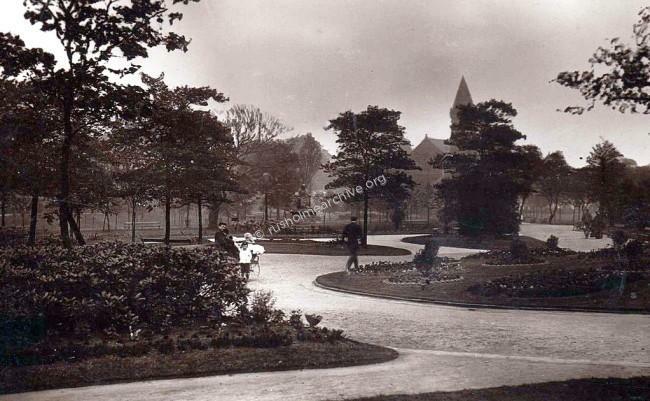 Originally known as Potter’s Park, the large site included Rusholme House (built by 1819) and Grove House (built between 1819 and 1848). 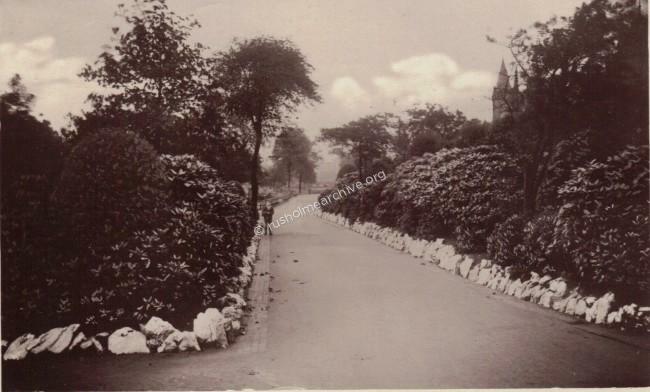 Rusholme House was demolished shortly after the land was purchased by the Whitworth’s legatees who immediately concentrated their energies on taking estimates and contracts for planting and creating avenues and walks; the radiating design of walkways they designed is still visible today. 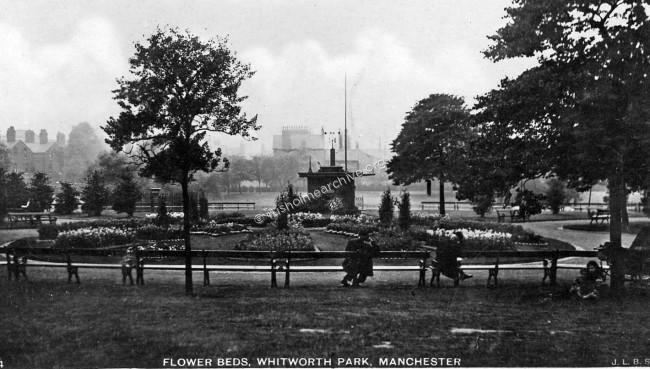 There was close co-operation between the Whitworth Committee and the Corporation’s Park Committee from the outset, and in October 1888 the Whitworth Committee requested that four members of the council should take advice from the Corporation’s Chief Gardener. 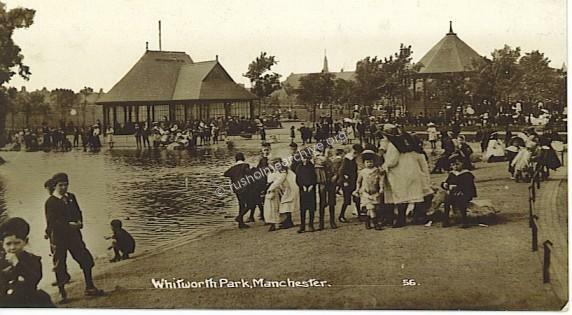 Within a year the Whitworth Committee had spent approximately £69,000 on the Park’s layout and draining, with a portion being spent on a bandstand and shelters. 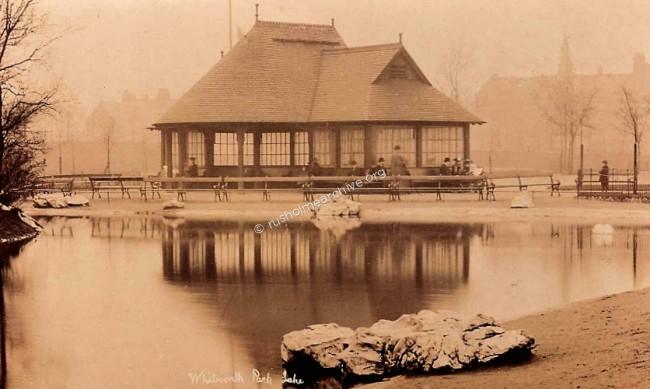 In keeping with the other parks dotted around Manchester a lake was sunk with accommodation for a fountain spurting up forty foot of water, and provision was made for a boat-house and landing stage. 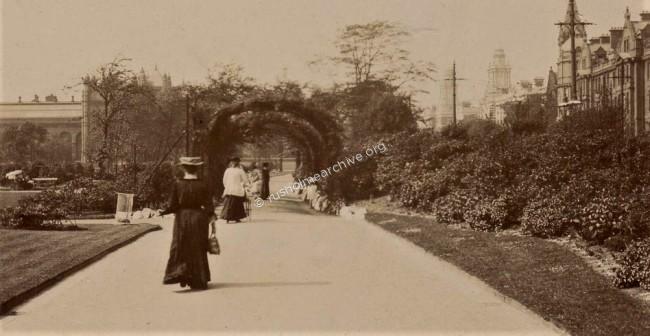 Although the name of the park’s designer is not known, it is documented that the Whitworth Committee sent their park superintendent to study the greatest parks and gardens in London and Brussels. 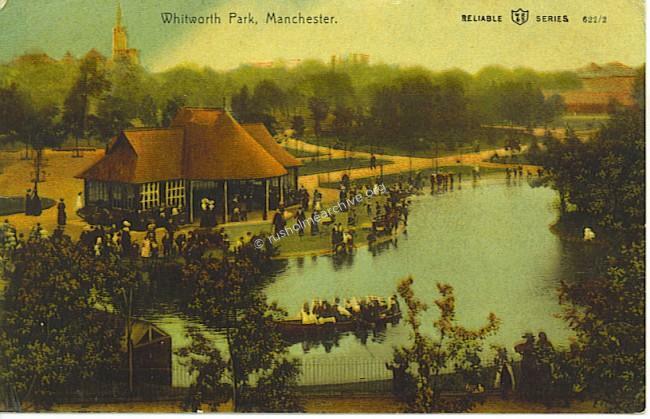 Although on a much more modest scale, Whitworth Park contained the formality of such open spaces as the Parc de Bruxelles with long avenues framed by trees and a circular lake for the crowds to gather round on warm Manchester days. 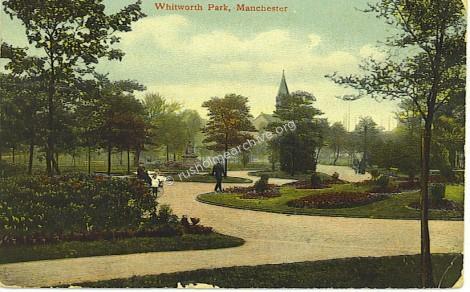 The Whitworth Institute and Park were intended to work in harmony and, in the Charter of Incorporation the intention was stated to ‘provide and maintain, with or without the co-operation of the Mayor, Aldermen, and Citizens of the city of Manchester, a Woodland Park and Pleasure Ground for the use of the public, in connection with the Institute ...’ However despite this ambition, the maintenance costs accumulated and, within a few years, the Governors were forced to seek the assistance of the Corporation in order to prevent the ‘15 acres of woodland being ‘turned into narrow streets of small houses, and the remaining attractions of a small suburb mostly destroyed’. 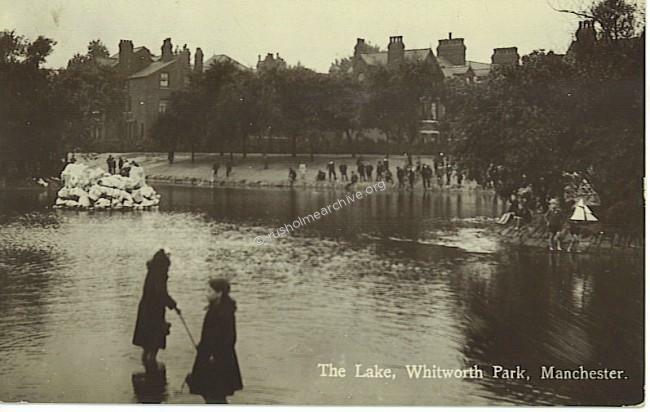 In a half-hearted attempt to bring in some income a boat, appropriately named ‘Lady Whitworth’, had been purchased which could be hired for various periods of time on the lake. However the income was not sufficient, and the Park continued to be a drain on resources; the sum of its maintenance accumulated to half that originally set aside for the Institute as a whole. 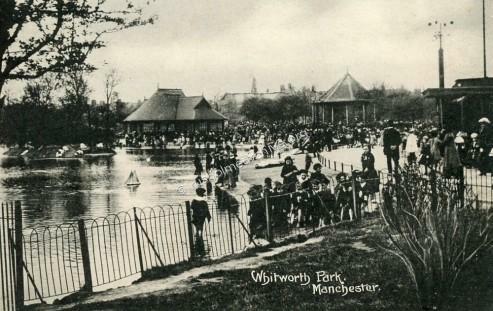 Although Manchester could boast a large number of parks by this date, (the park providing a healthy alternative to the ale house), including Queen’s Park (which also included an Art Gallery within its grounds), the Corporation greeted the offer of Whitworth Park with tremendous enthusiasm, and on 5 October 1904 the area of land was officially handed over for one thousand years for a peppercorn rent. 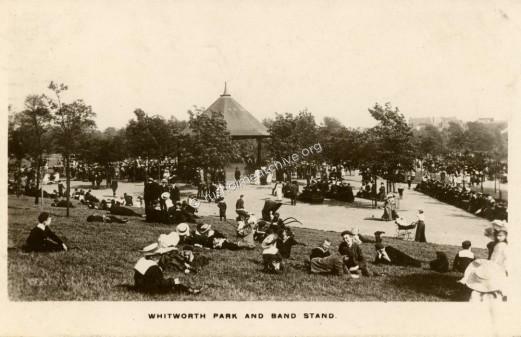 By this date Whitworth Park had begun to attract huge crowds, the bandstand proving the most popular attraction on Sunday afternoons when the local population were lured by the programme of entertainment provided by the Pioneer and Ardwick Industrial School Bands. 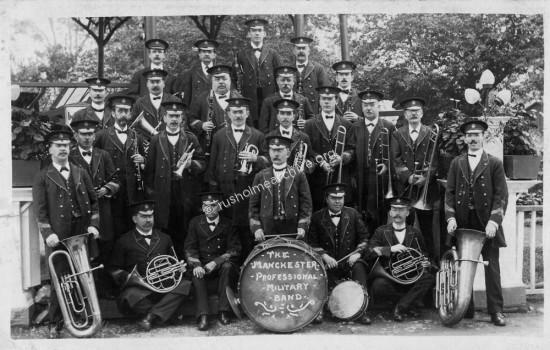 The Manchester Professional Military Band, (photo below),played regularly in the Rusholme parks and would have been playing here in the Whitworth Park bandstand. 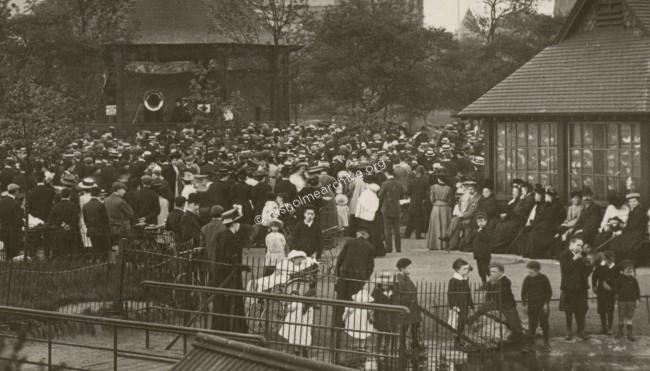 Close views of the crowd around the bandstand below. 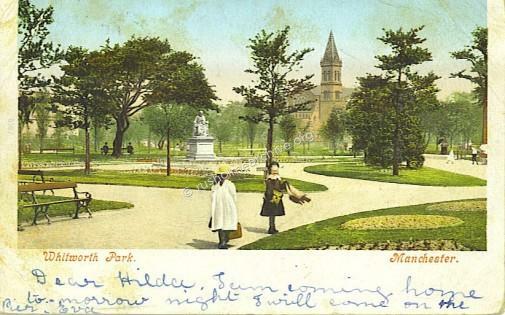 Postcard below undated, looking north. 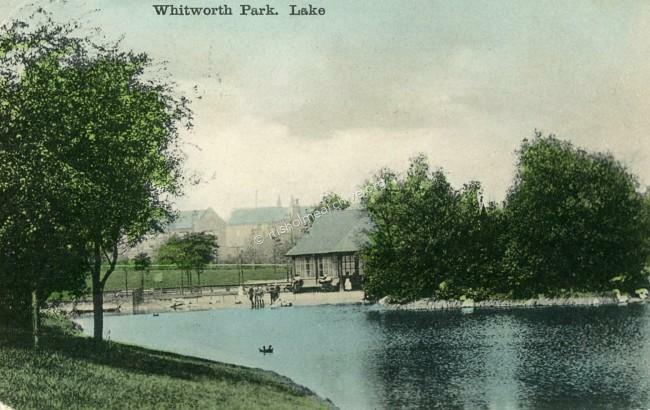 One of the largest green spaces near to Owens College, Whitworth Park became the site for a meteorological station in the early 1890s and an agreement was made on 8 March 1893 between Owens College and the Whitworth legatees for scientific apparatus to be erected as a source of ‘scientific and popular interest and of education’. 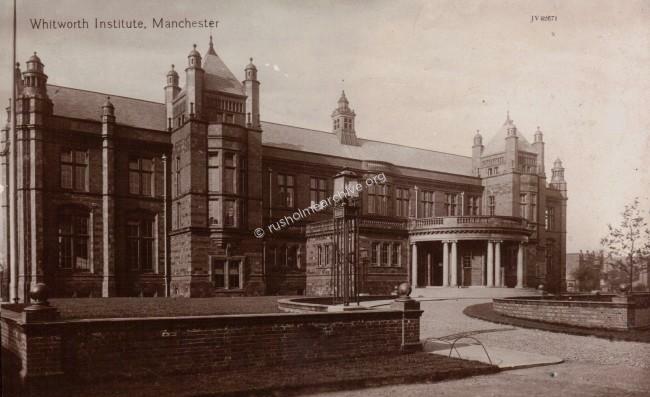 Whereas the College would be responsible for maintaining the Observatory and keeping scientific records, the legatees were obliged to pay the College £40 annually to fund a scholarship for an observer, managed by the Professor of Physics, to care for the instrument and record and tabulate the data for both the Manchester Evening News and the Corporation. 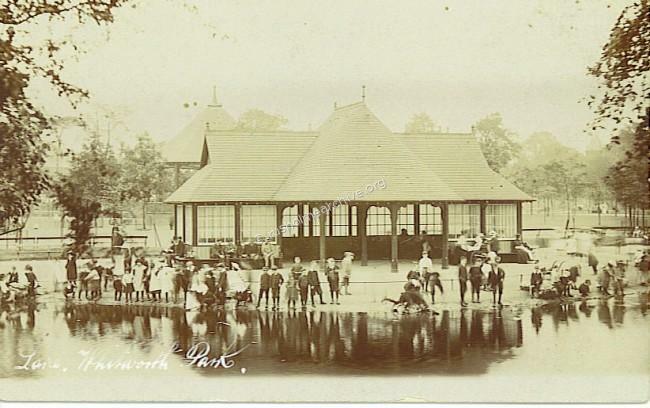 The station was positioned near to the Denmark Road entrance of the Park although underestimating its attraction to members of the public, in November 1904 the Town Clerk contacted the authorities of Owens College regarding its dilapidated condition. The following year Arthur Schuster wrote to the Chairman of the Parks Committee complaining that the plot of grass set aside for the instruments was too small, and thefts were all too common. To solve the latter he sought and was granted permission to put an iron railing around the Observatory hut, the expense of which was borne by Owens College. 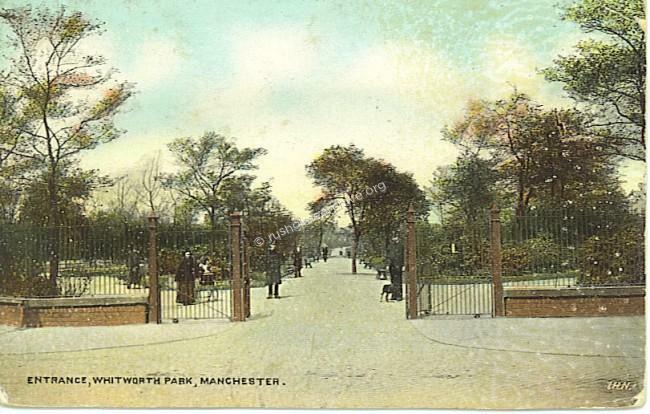 Postcard views above and below of the Rusholme entrance to the Park. The upper view is clearly taken several years before the lower card judging by the trees. 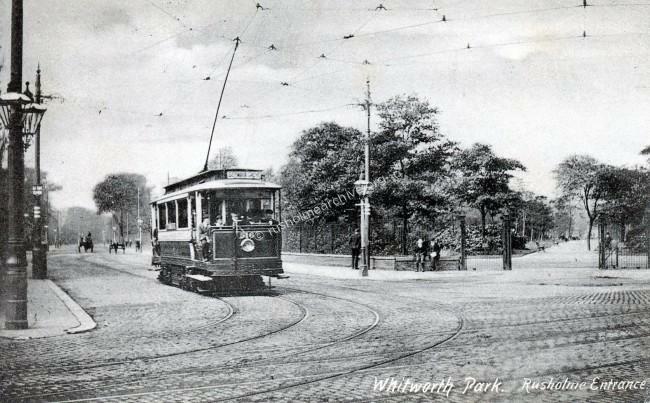 These views include the single-decker tram that is referred to on the 'Tour of Wilmslow Road'. 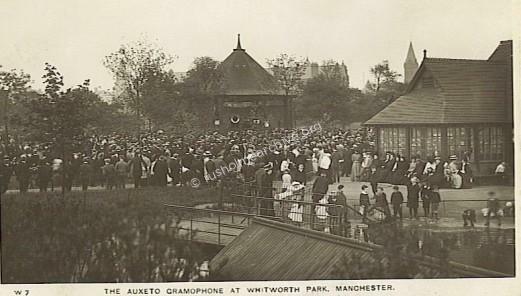 In the photographs, (dated 1912) above and below, you can see the very large crowds who had come to listen to the Auxetophone being demonstrated in Whitworth Park. The Auxetophone was the most successful and powerful mechanical device to amplify recorded sound. It was the product of combined efforts by Horace Short (of Short Brothers' aviation fame) and Sir Charles Algernon Parsons, inventor of the modern steam turbine engine. When playing gramophone records, this reproducer could be used in the open air, in a large hall, or even compete with an orchestra. The Auxetophone represented a radical shift in the function and reception of recorded sound and amplified music, making it possible for the first time in history to successfully play at significantly loud volume in public spaces. Despite endorsements by famous musicians, the auxeto met with hostility from the musical fraternity and a mixed response from the public. One critic suggested that the noise was so bad you would need a steam turbine engine to get away from the cacophony ! The disillusioned inventor not surprisingly abandoned his groundbreaking project. 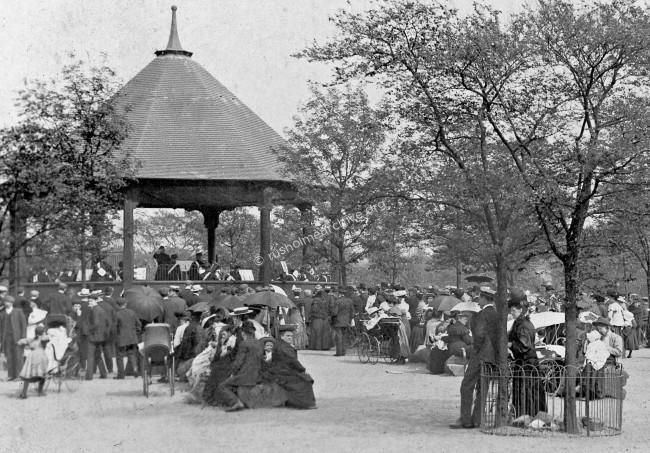 In the close-up view below you can see the circular horn of the Auxetophone on the Bandstand. There are two websites that have more information and a demonstration of a working Auxetophone - listen yourself to the sound played to the crowd in 1912! You will need to follow the link below to the René Rondeau's Antique Phonograph Museum where he explains and gives a demonstration on YouTube. The second link shows another selection and items of information about the Auxetophone. Switch on your speakers & listen here! 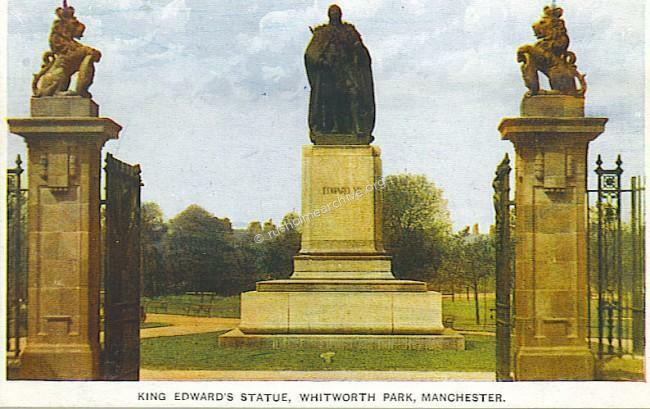 On October 16th 1913 the statue of Edward VII was unveiled in Whitworth Park. 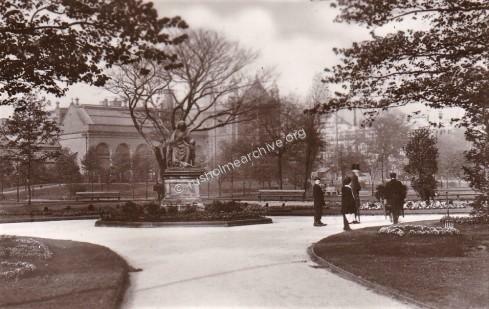 There were large crowds present and although the event was marred by the unexpected illness of the Lord Mayor, his wife formally unveiled the statue and Sir Edward Behrens, the Deputy Lord Mayor accepted the statue on behalf of the Manchester Corporation. 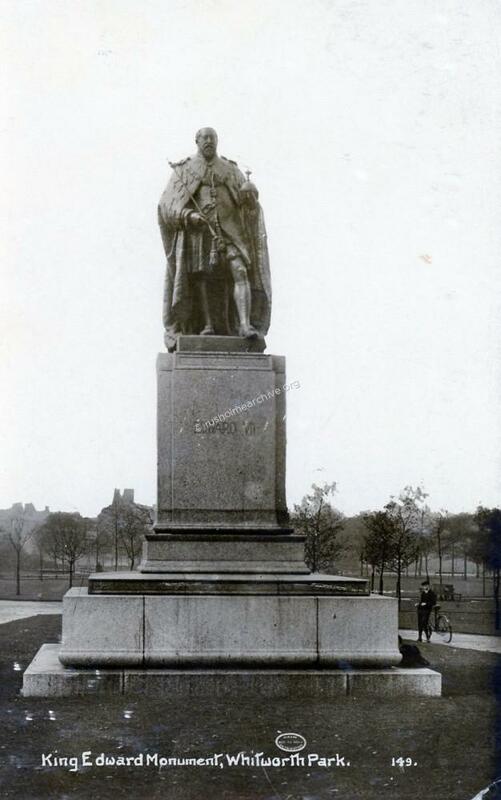 The statue that measures some 3 metres high was the work of John Cassidy, an immigrant from Ireland, who settled in Manchester and became a notably successful sculptor. 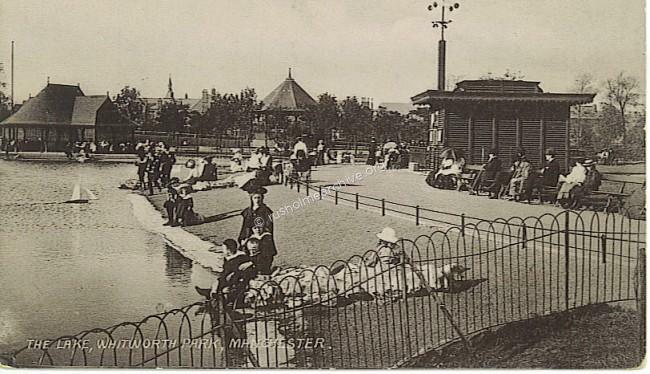 He was also popular amongst other Manchester artists and held office in the Manchester Academy of Fine Arts. 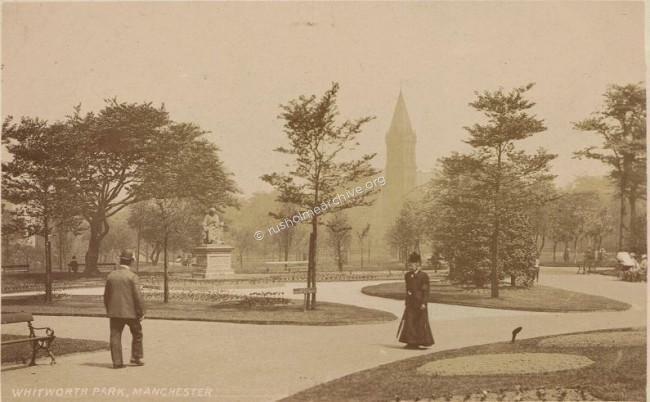 The statue was the gift of a Manchester businessman, James Gresham who commissioned Cassidy to do other work. Sadly the large and grand gated entrance no longer exists but the sculpture has recently been refurbished and stands quite serenely, regardless of the park pigeons! If you would like to read more about John Cassidy there is a website devoted to him, follow the link below. 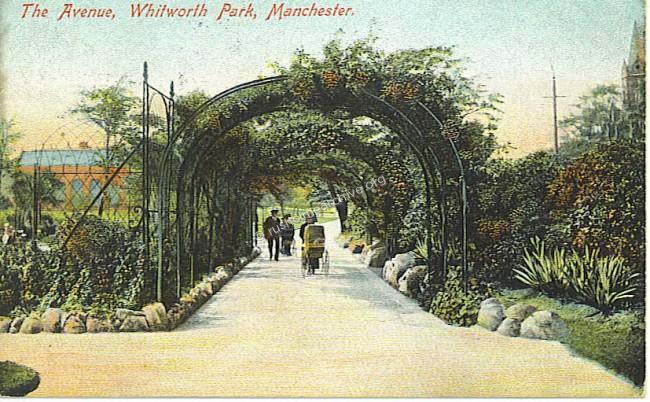 'Whitworth Park depends mainly for recognition on its flowers and foliage. 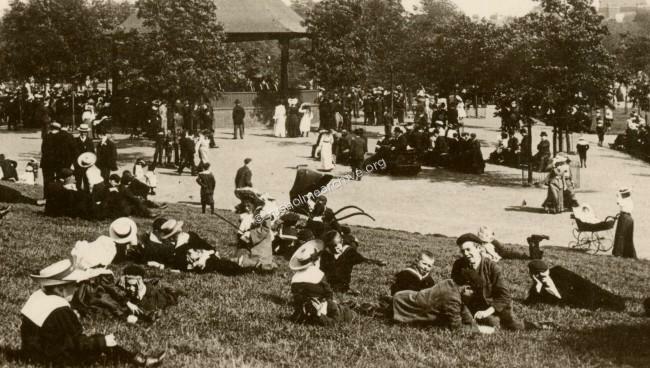 Laid out in the main as a stretch of woodland, interspersed with avenues and gardens, the show of flowers from spring to autumn offers a welcome and delightful relief to the drab of the streets. The terraces and banks of flowers and flowering shrubs around the gallery make an effective foil to the level character of the land, as do also the numerous belts of trees and the winding walks. The art and aim of the landscape gardeners have been to avoid formality and to allow the place to look as natural as possible. An ornamental lake with two miniature islands sets off one side. 2 Postcard views below of the lake & meteorological station. 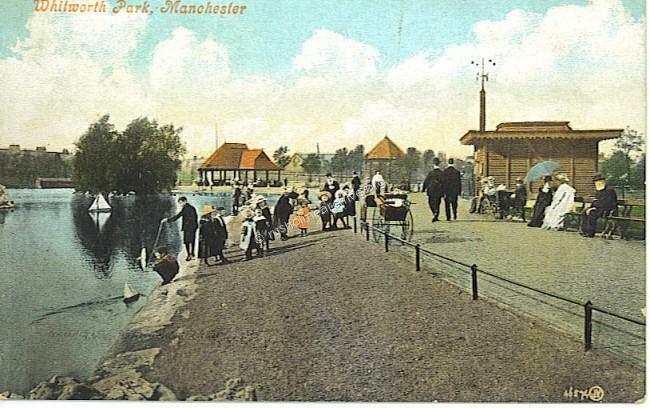 The first view below is looking in a northerly direction towards Manchester, the meteorological station is on the left, the card is dated 1911. The second card is a more unusual view, looking west the meteorological station is in the centre of the frame with the lake in the background. The card is undated but is probably from the early 1920's. 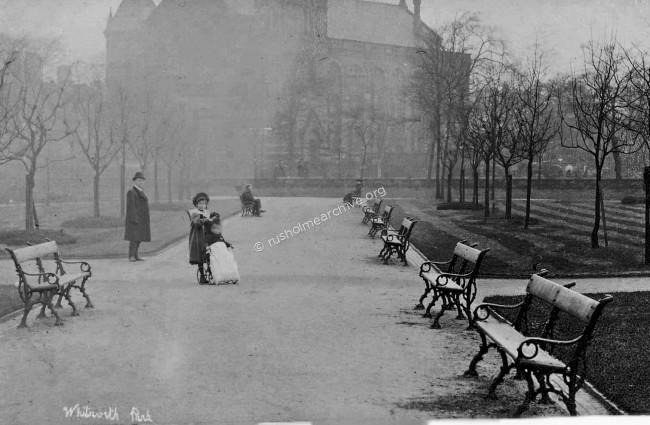 In most of the photographs in the park that are taken facing in an easterly direction towards Oxford Road you can see the tower of the Oxford Road Baptist Chapel. (6 examples below). 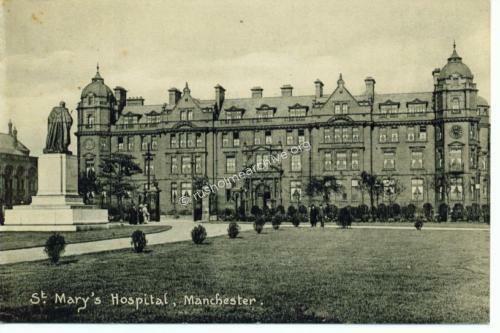 The first and second photograph have been taken by the same photographer on a misty day day, the first card is dated 1905, the second is 1907 The fourth photograph, dated 1936, shows the Baptist Chapel sitting between St Marys maternity hospital on the right and the Manchester Royal Infirmary on the left. 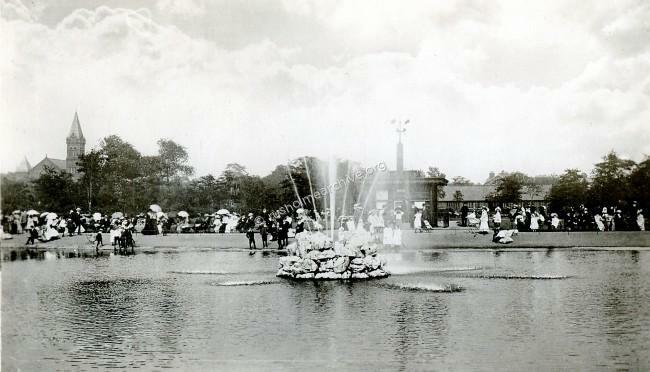 Both the Gallery and particularly the Park flourished in the early 1900's. It was surrounded by a areas of dense housing, particularly, Hulme, Chorlton-on-Medlock, Moss Side and perhaps to a lesser degree, Rusholme. 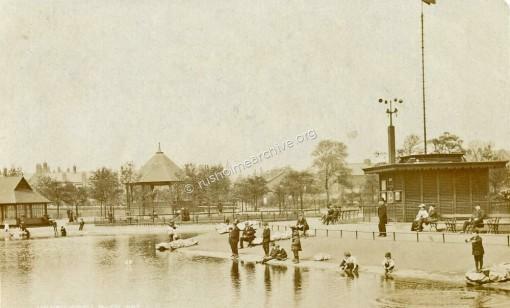 Many of the photographs show the lakeside was inevitably popular with children & the park, according to press reports at the time , did draw large crowds., particularly in the summer. In spite of the generous legacy that was left by Sir Joseph the Gallery was finding itself in financial difficulties. 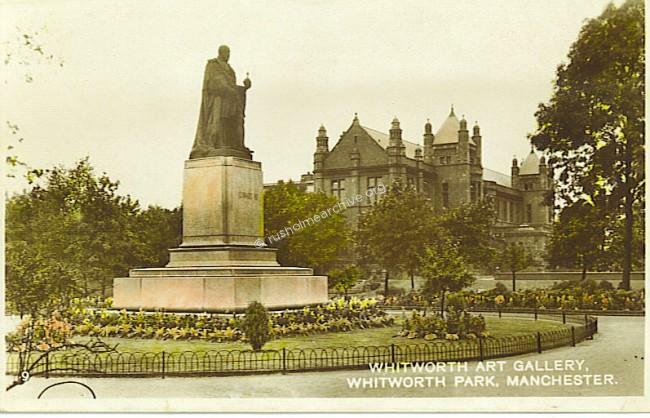 It had benefitted from many gifts and legacies for its collection but in 1931 it was reported in the Manchester Guardian under the headline, 'Penury at the Whitworth' that the Governors were struggling to keep the Gallery open and in a good state of repair. 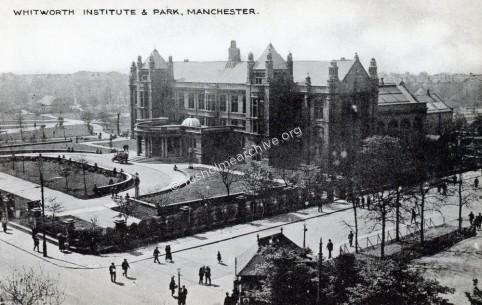 Although it was recognised that the collections at the Gallery were of national significance it struggled financially along until in 1958 it became part of the University of Manchester. Since that time it has flourished again and it is planned to soon have a multi-million pound extension. There is also an active group, The Friends of the Whitworth that provide help to the Gallery in a number of ways. Below are links that you may want to follow. 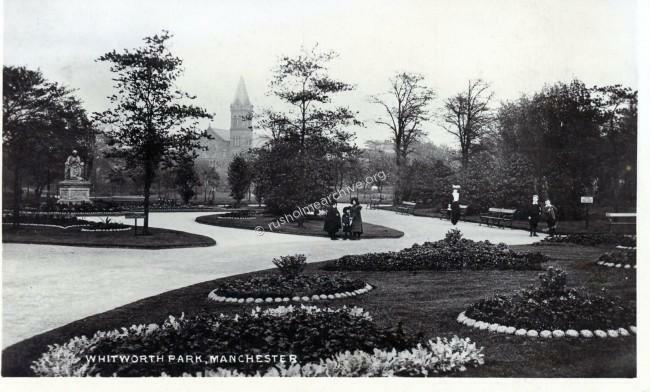 The Park, under the care of Manchester Corporation, has over the years gone through a gentle decline. 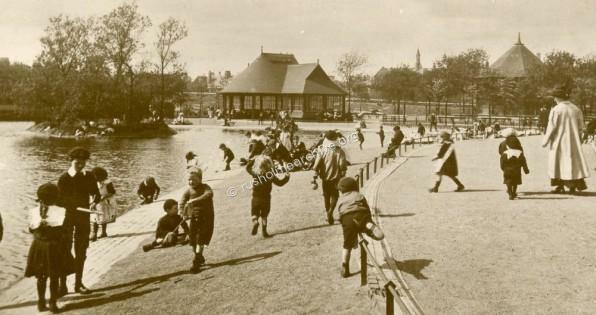 The change in the expectations of entertainment, the loss of much of the population in the immediate area, running costs, safety concerns about the Lake as a paddling pool and very strict budgets after WWII all contributed to the Parks decline. 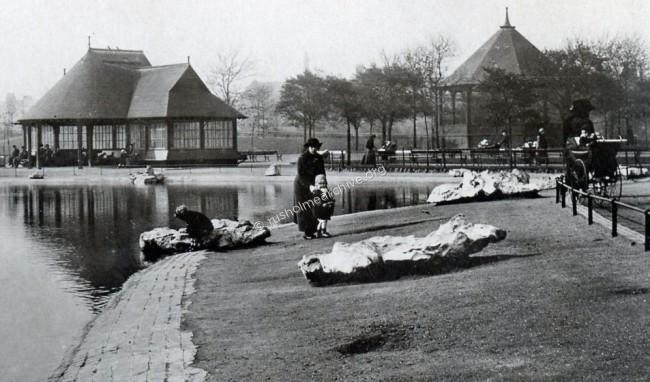 In 1954 the Parks Committee decided that the shrubberies would be cleared, and grassed over. 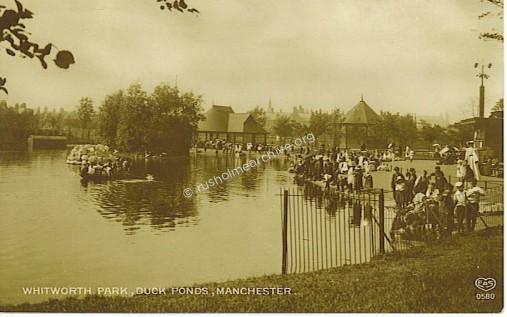 The lake was to be filled in and together with the site of the old bandstand that was also to be grassed over. 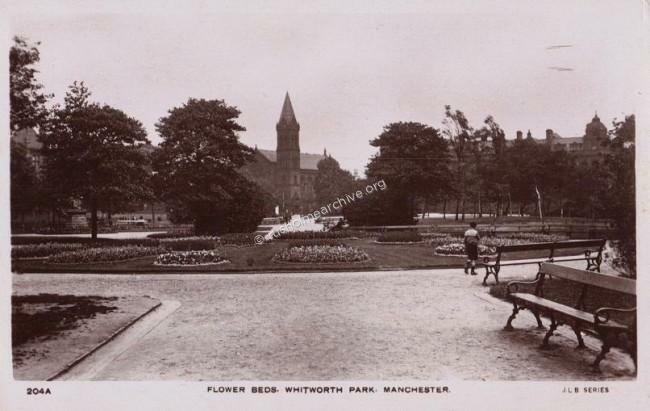 More recently a group has been formed, The Friends of Whitworth Park, and a modest start has been made to revive some of the more attractive features of the Park. 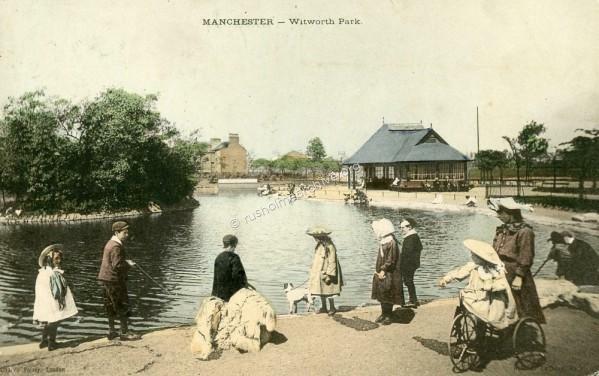 They have also entered into a partnership with the University of Manchester Department of Archaeology, The Manchester Museum, the Whitworth Art Gallery, and the Ahmed Iqbal Ullah Race Relation Resource Centre to uncover some of the fascinating history, archaeology and biodiversity of Whitworth Park. If you would like to read more about this follow the link below. Like other parks many photographs were taken and sold as postcard views. Many survive, some seem a little strange these days, perhaps just snapshots but they all evoke an atmosphere that is unlikely to be seen again. In the postcard below can you see the boy on the right with his model yacht? Unusually in this postcard view below there are no other children, dated 1937. There is a gallery beneath of other views, just click on the picture you want to see and it will expand!